This is a Field Ant. Field Ants come in a variety of colors. 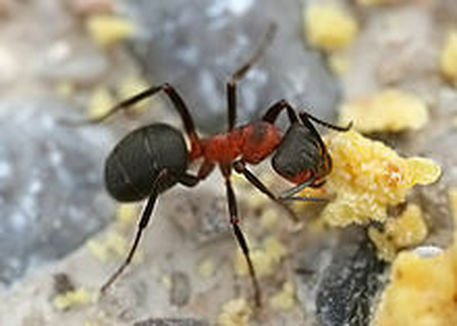 They can be black, yellow, red or black and red (like in the photo of the ant above). The reason they can look different is because several species of ants fall under the term "Field Ant." You can find these ants in your garden, your back yard, in county parks or any type of field, grass or wooded setting. They like rocks, sidewalks, trees, lawns, and they are very adaptable. You can find mounds they create which are often made up of the local grasses. What do Field Ants eat? Their main source of food is the honeydew that Aphids produce as a defense so the ants don't eat them, but they will also eat protein in the form of other insects or meat scraps dropped by humans. How do Field Ants get into my home or business? Field Ants generally do not invade your home. If you have ants in your home, it's likely another type of ant. Because Field Ants can be red or black ants they are often confused with other home invading types. They can still be pests, though, especially if you are trying to enjoy the outside of your home and it's infested. How do I get rid of Field Ants? Like all ants, Field Ants have to be treated at their source. We can also apply chemicals that will prevent this type of ant and other types of ants from coming back. Contact us and we will be happy to help! Click here to find out about Fire Ants!